The process of germinating seeds to be eaten is called sprouting. The practice involves soaking seeds, legumes, grains, or nuts, followed by an incubation period. You soak and incubate the seeds until they grow a tail-like protrusion. The soaking period increases the water content in the seeds and brings them out of seed dormancy. After draining and then rinsing seeds at regular intervals they will sprout. Soaking and sprouting time is unique to each type of seed, nut, grain, or legume. For some seeds soaking for 20 minutes is enough, for others several hours are required – depending on the type and size of seed. For example, mung bean sprouting takes 8-12-hour soak followed by about four days of incubation and rinsing. Lentils, on the other hand, need 7 hours of soaking; and sprouting takes 2-3 days. While the process may seem complicated, it is quite easy and does not need any special equipment. Many people swear by it because of the many benefits that come with sprouting. Considered a wonder-food; sprouts can be eaten raw, steamed, or cooked. Due to the high nutritional value, they offer many health benefits. Sprouts contain various enzymes that eliminate lectures and boost metabolic processes in the body, particularly digestion. Because of the dietary fiber found in sprouts, they pass through the digestive tract easier, they stimulate gastric juices and effectively build a microbiome that efficiently breaks down food. 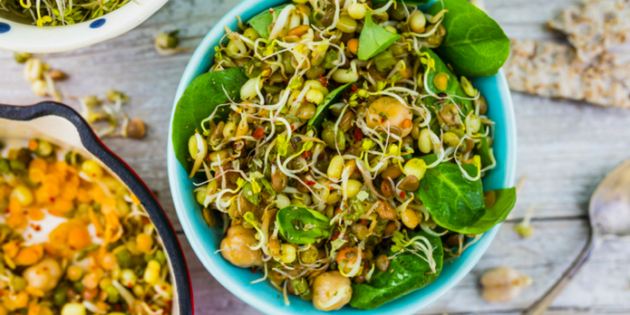 Sprouts help you fight anemia and the other symptoms of iron deficiency and undernourishment. This superfood contains significant amounts of iron and copper which help the body maintain red blood cell count. When you have sufficient iron in your body, you also have optimum nourishment for your skin and hair so you also look better when you consume sprouts regularly. Sprouts are also rich in protein, the building block for your muscles, bones, skin, cartilage, immune cells and blood. Proteins are involved in almost every bodily function. Amino acids, the building blocks of protein are more concentrated in sprouted foods and also more digestible and absorbable. Because sprouting also increases the seeds’ fiber content, eating sprouts helps push waste and toxins out the gut, improving digestion and regulating bowel movements. The fiber in sprouts also keeps you feeling full for longer, helping you avoid snacking between meals and overeating. And while sprouts are high in nutrients, they’re low in calories. Ultimately, eating sprouts comes with various health benefits. They boost the immune system, improve blood circulation, and aid digestion. And because they are rich in antioxidants, they protect the body against cancer. Sprouts have even been linked to the prevention of cataracts and macular degeneration and they are great for helping heal from viral infections. 1 piece of 100% cotton cloth large enough to cover the seeds in the container. Place the seeds in a sieve, drain the water and rinse the seeds well. Scoop the damp seeds out of the sieve and place them on a piece of 100% cotton cloth. Wrap them up in a moist cloth and place in a dark place on a plate. Leave them for 12 hours – 5 days, depending on the seeds. Check them regularly. Very soon you will have sprouts.